By: Carola Vyhnak Special to the Star, Published on Fri Jun 19 2015. View Article. Ask architect Harry Christakis about his professional relationship with Mona Bhamani, the developer behind the new Vida condos coming to Bayview Village, and he starts laughing. On their first project almost a dozen years ago, he produced a design that was, shall we say, understated. The president of Castle Group Developments wasn’t satisfied “with anything normal or banal,” he chuckles. Christakis went back to the drawing board and ended up designing all three of the company’s condominium projects that preceded Vida: Bellair Gardens at York Mills, The Palm in North York and Tuscany Gates in Mississauga. “He understands what I’m looking for,” explains Bhamani, noting her “passion” for creating landmark buildings. The business partners’ latest achievement — Vida translates to life in Spanish — catches the eye with its stepped design of three, six and eight storeys offering a total of 201 suites from small to spacious. She says “Vee-da” and he says “Veye-da” but, otherwise, the creative duo is clearly on the same page with their vision of a midrise building that both stands out while fitting into the surrounding environment. Designed along urban contemporary lines, the façade of iridescent glass is accented by geometric bands of concrete stone that resemble the links of a bracelet, explains Christakis, of HCA Architecture. “It has to be a good fit to be a good neighbour to the existing fabric of the community,” he says of the “fantastic” residential area that’s anchored by upscale Bayview Village Shopping Centre at the intersection of Sheppard and Bayview Aves. Built diagonally across from the mall on Sheppard and just minutes from Hwy.  401, the Sheppard subway line, buses and Yonge St., Vida will connect to everything residents need to live, work, play, shop and commute, its conceivers point out. Parks, walking trails, schools and hospitals are also within easy reach. “This project will fit perfectly there,” says Bhamani, whose ideas are influenced by her travels — Dubai in particular — and her father, who was a leading architect in south Asia. Early purchasers think so, too. “This is the perfect location,” says Lily Liang, an ophthalmic technician whose job is five minutes away. “And it’s lowrise, which I like,” adds the current Scarborough resident, who’s just secured her first home, a two-bedroom condo on the seventh floor. Vida’s “million-dollar look” is affordable for purchasers at both ends of the spectrum, whether they’re students or down-sizers, says Bhamani. Units range from 328-square-foot studios to 1,600-square-foot, custom-designed penthouses and come in configurations of one- and two-bedroom with and without den, and three bedroom. Prices start at just under $200,000 and go up to $1 million. Vida is right on the money when it comes to the city’s housing needs detailed in a recent report by the Pembina Institute. The think-tank concludes affordable, midrise condos are desperately needed in walkable, transit-oriented neighbourhoods. It was Bayview and Sheppard’s easy access to amenities that attracted Eduard Beca and his wife Veronica Adina Beca to Vida. They lived in the community 10 or 12 years ago and are well-acquainted with its proximity to Hwy. 401, biking trails, YMCA, public transit, favourite mall and subway to downtown concert venues. “All good reasons,” Beca says of their decision to buy a penthouse that’s about half the size of their detached house in Thornhill. The couple — he’s an engineering manager; she’s a teacher — will not just be downsizing, they’ll be “coming back home to an area we love,” Beca says. The boutique building, expected to be completed in 2017, caught his eye for the same characteristics the developer strives for. Christakis likes to think of Vida as “a beauty with personality.” Organized around a landscaped central courtyard, the building will have a European feel with its small retail component, outdoor café and seating areas where residents can unwind or enjoy a coffee, he says. Comparing it to the Park Hyatt hotel on Avenue Rd., which he also designed, Christakis says the courtyard and arched entranceway will create a “strong sense of arrival” while connecting outdoor and indoor spaces. The lobby also reveals a hotel influence with the addition of seating, fireplace and lounge. Amenities, which Christakis located on the ground floor “in the sunniest spot of the property,” include a sports bar, party room with chef’s kitchen, outdoor barbecue terrace and fitness centre. It all adds up, Christakis believes, to that “wow” factor Bhamani demanded all those years ago. Size: 3-, 6- and 8-storey stepped design; 201 units from 328 sq. ft. to 1,600 sq. ft.
Info: vidacondos.com, 416-304-1212, info@vidacondos.com . Sales centre at 621 Sheppard Ave. E.